The 23rd Psalm in The Bible is one of the most beloved and certainly most well known psalms. Beginning with “The Lord is My Shepherd, I shall not want…” it is often attributed to King David. The psalm is sung in Hebrew at the third Sabbath meal on Saturday afternoons and is often recited during funerals instead of a traditional prayer. This artful representation shows a shepherd leading his flock into the light. 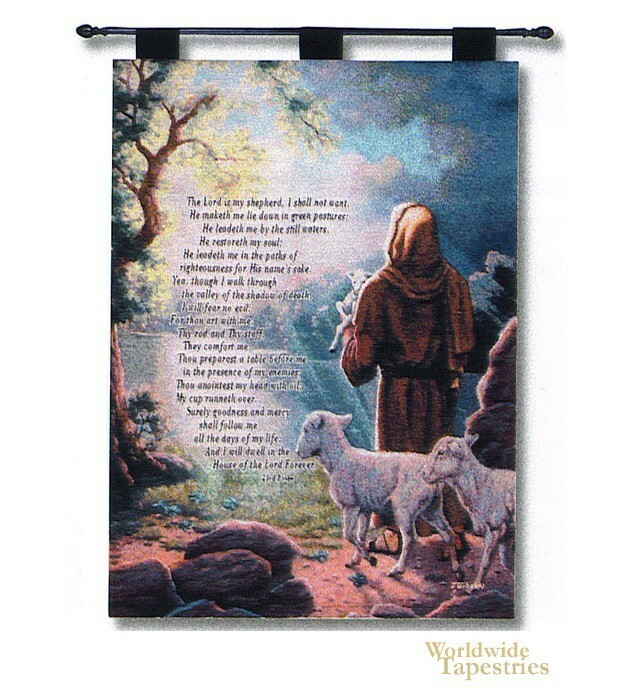 Filled with symbolism and the mysteries of faith, “The Lord is My Shepherd” tapestry has the complete psalm in a beautiful typeface. It is a joy to behold and will become a cherished addition to your home. It comes with a lined back and has tabs for inserting a hanging rod. Note: tapestry rod and tassels, where pictured, are not included. Dimensions: W 26" x H 36"